Please enter our facility through the sliding doors on the EAST side of our building. Entrance fee for the yard is $2 cash only. NO ONE under the age of 18 will be permitted into the yard. If you are looking for TIRES in our tire area, you must sign in, but will not be charged $2. This is a SELF-SERVICE YARD. All customers must bring their own tools and the knowledge to pull the parts they need. WE DO NOT LOAN TOOLS. See the rules below for a list of tools NOT allowed in the yard. Wilbert’s Employees CAN NOT help you pull any parts in the yard! When you sign in, a Wilbert’s Employee will ask you for the year, make, and model of the vehicle you are looking for. 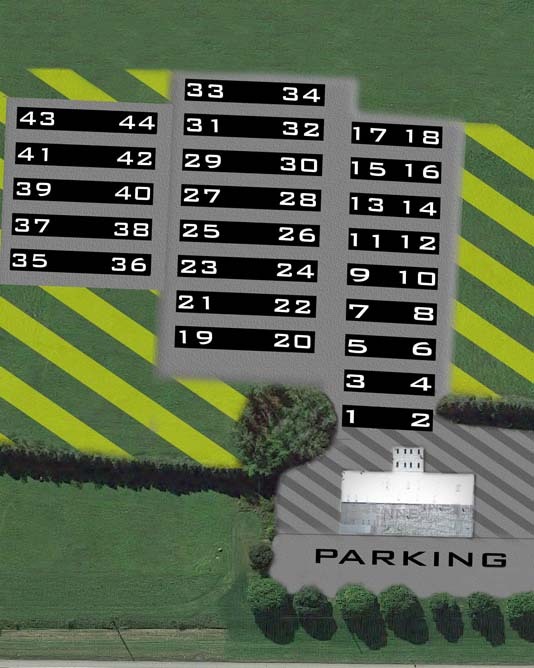 They will provide you with a ticket telling you the location in the yard where you can find the vehicles. Please be aware that we DO NOT inventory the parts on vehicles. We also DO NOT inventory the color, mileage, or trim level of the vehicles. Upon entry, maps are available to guide you to the area you are looking for. Wheelbarrows and carts are available for easy transport of your tools and parts for free. NO OUTSIDE PARTS are allowed into our yard. If you bring a part in, you WILL be charged for it on the way out. We suggest taking a picture of your parts before entry to make sure you pull the correct part. After you have found the vehicle you are looking for and pulled your part, you will bring the part or parts back to the retail area of our store. At this time, you will pay for all parts that you have. PLEASE BE AWARE that most assemblies are charged per part! For example, if you remove an engine assembly, you will be charged separately for the starter, throttle body, alternator, etc. We recommend recording the Stock Number and VIN Number of the vehicle from which you pulled your parts for your records. Wilbert’s also has a Full-Service Tire Shop, where we can provide the major tire services you need to use your newly purchased wheels and tires! No jacks, torches, oxygen bottles, body saws, compressors, grinders, etc. allowed in the yard. Battery powered tools are permitted. Cuts are not allowed to vehicles and will NOT be sold if brought to checkout. This is a Tobacco & Alcohol-free facility. No smoking or open containers (of any kind) on the property. In consideration of all customers, we do not allow pets in the yard. In consideration of pets, do not leave them unattended. NO ONE under the age of 18 may be admitted in the yard. Proof of age will be required. You may not leave underage children unattended. We reserve the right to search all containers and/or personal belongings both entering and leaving the premises. We DO NOT LOAN TOOLS, we are completely self-serve. Parts are NOT allowed in the yard. You will be charged for all parts brought to the checkout counter. Respect all RESTRICTED AREAS for your own safety. These areas are clearly marked. Customers must walk the yard, no motorized vehicles. Payment must be cash or credit/debit. We do not accept checks. Weapons are not allowed on the property. Anyone stealing or vandalizing the property will be prosecuted to the fullest extent of the law. Anyone breaking these rules or not observing the safety policies of the yard will be asked to leave without any admission refund. ** 2% environmental fee added to all purchases. If you are not satisfied with the part you purchased, you can bring it back for an exchange or store credit within 30 days of purchase. Store credit is valid for 90 days from original date of purchase. Store credit is valid for 90 days from the original date of purchase. You must have a valid receipt dated 30 days or less, and the part must be marked. Be sure your parts are marked at the time of purchase, in case you need to return them. What is Wilbert's U-Pull It? We are a self-service auto parts recycler. You save money by removing the parts from a vehicle yourself. What is the cost of entry and why? $2 CASH ONLY per person. All customers must be 18 years or older to enter yard. This forms a binding contract and helps to cover the cost of insurance. What are the benefits of a U-Pull It auto parts yard? You save money by removing parts yourself. This also helps ensure you get the correct part the first time. Why do you need my birth date on the admission waiver? We need to verify your age for insurance purposes. Why am I not allowed to bring my child out in the yard if I am supervising them? Wilbert’s insurance strongly states that you MUST be 18 or older to enter the yard. NO EXCEPTIONS! What is a CORE and why are there CORE charges on just about everything? CORE stands for Cash On Receipt of Exchange. If you bring back your old part within 30 days, we will refund your CORE charge. This process helps ensure that the maximum number of parts are recycled. We prefer to recycle the original part for you rather than have it end up in a landfill. What do I need to pull parts? You will need your own tools which will be checked in on arrival and checked out upon exit. We do not sell, rent or supply any tools. Make sure you bring what you need to pull the parts that you are looking for! What tools are not allowed in yard? We do not allow jacks, torches, oxygen bottles, body saws, compressors, generators, battery packs, etc. Why am I not allowed to smoke in the yard? It is nearly impossible to extract all the gas from the vehicle. Therefore the yard is filled with fumes which makes it extremely dangerous for any type of flame or spark to be in the yard. There is a strict no smoking policy for the entire Wilbert’s facility and yard. Are battery powered tools allowed in the yard? YES – We do allow hand held battery tools in the yard to assist in pulling parts. Are pets allowed in yard? NO – Due to potential dangers to our customers, inventory, and the animals themselves, we do NOT allow pets into the yard. What is the Environmental Fee and why do I have to pay it? Wilbert’s adds a 2% charge to all purchases to help keep the yard clean and organized. What do you offer to assist in pulling parts? The customer is required to bring all tools required to remove parts, as we do not loan tools. Wilbert’s U-Pull It wheelbarrows, carts and engine gantries are available at no charge for your convenience. Wilbert’s does have two full service facilities that will pull parts for you, Wilbert’s PRP and Wilbert’s Lakeside. Where am I allowed to smoke? This is a tobacco & alcohol free facility. Anyone breaking these rules or not observing the safety policies of the yard will be asked to leave without any admission refund. Smoking areas are provided out front in the parking lot of our facility. Why am I not allowed to bring my coffee into the yard? Wilbert’s has a strict policy of no open containers allowed into the yard to ensure the safety of all our customers. I just want to look, why do I have to pay $2? Many customers want to look at first, however we have to charge $2 for insurance purposes to gain entry into the yard. Why do I need my receipt if the part is marked? Proof of purchase date. We can not issue store credit without the receipt number. This ensures a part can only be returned once. What parts can't you sell? Airbags, catalytic converters and pistons.